Easter -- Most people associate the Easter bunny and some colored eggs during this day. Easter isn't today though. It will be tomorrow. Two years ago, I painted some Easter eggs which were donated to the church. This year, I won't be doing that. Although we did boil some eggs today, we were not in charge of painting them which was a good thing as I was in no mood to paint today. The death of my child has made me enjoy things less. That is the reality of it. Usually, anything art related is something that I enjoy doing. Art is one of my passions in life. Now, I am staying out of it for a while. Just like reading books and watching shows or movies. I used to enjoy doing that a lot but now, I only get to enjoy it temporarily and then afterwards, I find myself sinking in sadness. I might paint some Easter eggs again next year but that isn't sure yet. A couple of years from now, I hope to be able to paint them again but this time with a new little one. I don't mind painting with children. I guess I just want to paint something with my own child in the future. It is one of the things that I would like to do when I become a mother. Although I have never done the same thing with Lilly, I know that there will come a time when this will be certain. Hopefully, God will grant me this wish. After all, I rarely ask for something from him. Apart from the keeping us strong, safe and without sickness part of my prayers, the rest includes apologizing and of course, being thankful for many things in my life. Easter also marks the end of the month of March which only means my birthday will be here soon. I am not really a birthday person. I don't really like celebrating my birthday. This year will not be any different. In fact, this year will probably be the saddest birthday that I will ever have. I thought I would finally become a mother at the age of 27 or 28 but look at me now. I was 27 when Lilly was born but she was taken away from me just like that. I never even enjoyed being with her for so long. I never even kissed her, hugged her or cradled her in my arms. There are so many things that I would have wanted to do with her. Many people wanted me to have a baby boy but deep inside my heart, I wanted a baby girl. I wanted a little princess. After two years of being married and of praying to have a little one, God gave her to us. We were the happiest parents alive then but we were also the saddest when she passed away. We wished to become parents before we reached the ages of 30 but it just was not meant to be. 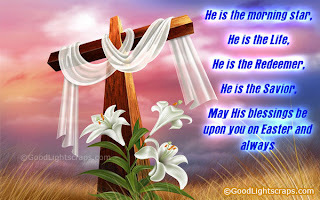 Easter marks a new beginning for many people but I don't know if it will start a new beginning for me. Although they say I should just move on, forget about the past and start anew, I can't right now. I wish they would understand that. I need time to grieve. For how long? I do not know. I just need time for things to settle. I need time for me to cry and hope that one day, I won't be crying this much anymore. Easter and lilies -- Now, I know their relevance and why they are connected with each other.